Restricting Blood Flow in the veins of a working muscle to elicit gains in size and strength. is effective when it comes to having lagging body parts, injured limbs or achieving that superior 'pump' that we all love. 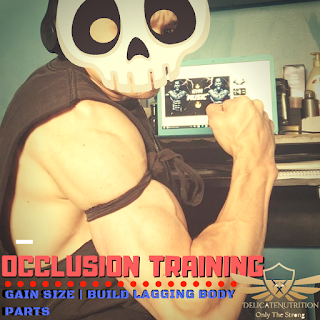 Occlusion/Blood flow restriction training, you need occlusion [wraps] to slightly cut off the circulation to the muscle that you're wanting to train. This is how occlusion method is performed - with a band. Don't cut off your blood to tight, just enough where you can feel it a bit. For example, occlusion training for Bicep/Arms. You wrap the occlusion band around your arm, below the shoulder, above the bicep to cut off a slight blood flow to the area. This as I mentioned can be used on Legs and Arms. you'll achieve a pump much much faster and you don't even need heavier weights. In fact, you don't need to use heavy weights to start off; the goal is to get the massive pump. Light weight (I'd say: 50% from your heavy set/weight) will provide you the pump I'm making you aware of. Watch my Arm Occlusion Training Video! I find Occlusion (Blood flow restriction method) training is helpful and effective. I do see results whenever I use blood flow restriction. Don't be a fool and hurt yourself with this method; play it safe and do it as it's directed.